Suckler cow strategies will come under the microscope later this month when the Greenshields family open their gate at South Mains, Sanquhar on 29 August and discuss the benefits of introducing the Stabiliser to their 180 cow herd. 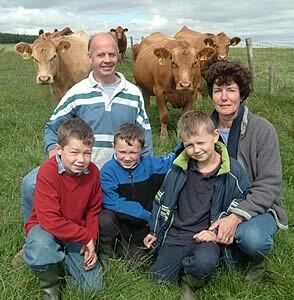 Douglas and Lorna Greenshsields with John, Robert and Andrew and some of their purebred Stabiliser cows. Introducing the Stabiliser as a modern functional suckler cow to South Mains is beginning to make a significant contribution to cost savings as well as improving overall output. “Better health and fertility, reduced calving problems, and lower labour requirements are among the benefits together with the opportunity to work with cattle with a quiet temperament,” explains Mr Greenshields who is currently up grading a commercial suckler herd to pure Stabiliser status on the 1,700 acre LFA unit which he farms in partnership with his wife, Lorna and also carries a 2,100 ewe sheep enterprise. Five years ago, Douglas and Lorna Greenshields were among the first producers to introduce the Stabiliser as a damline to Scotland. “We became aware of the Stabiliser is a composite damline which had been originally imported from the USA eight years ago where it was developed to deliver consistent high quality beef produced for least cost per kilo in subsidy free systems which reflect those in the UK post CAP reform. While the couple have carried out ET work and now have a small purebred herd of Stabilisers, their main focus is on grading up their 180 cow commercial herd. Five purebred Stabiliser bulls run with the herd and so far all the heifers have been retained. “We’ve found these Stabiliser crosses, the F1s are reaching sufficnt body weight to calve at two years. Calving problems are now minimal, and consequently the workload has been reduced, and new born calves tend to be more lively. The number of barrens has been halved during the past two years to 6%, and overall fertility has improved to the extent the calving pattern has tightened enabling 90% of the herd to calve over three cycles. Further details on the South Mains open day can be obtained from the Stabiliser Cattle Company’s Richard Fuller on 07970 097519.